Over the course of the day I ate another entire medium pizza from Panago. Remember everyone, I have a paper due on Thursday! I also had a lemonade juicebox. 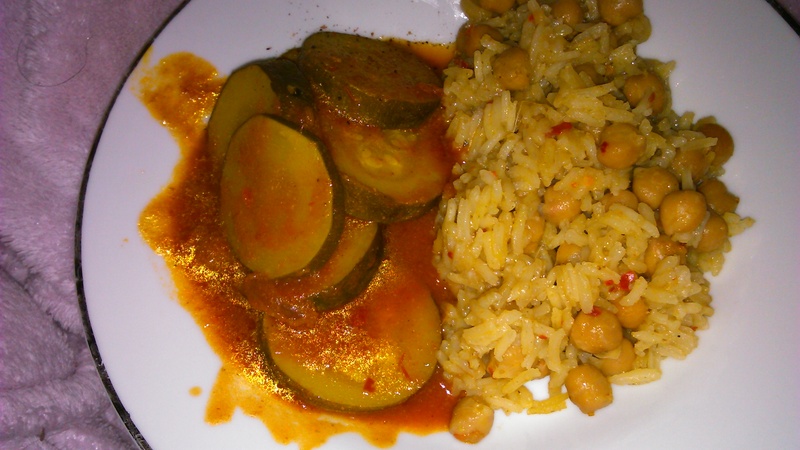 Zucchini salin with chickpea pilau. 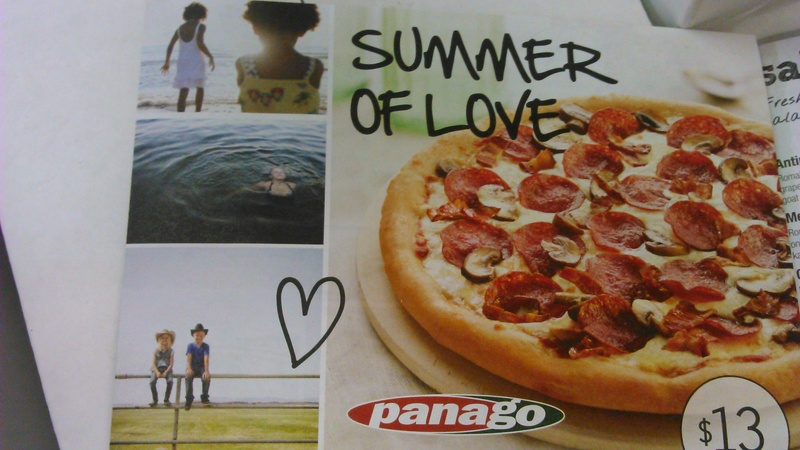 I ate a pizza from Panago. Literally an entire medium pizza. 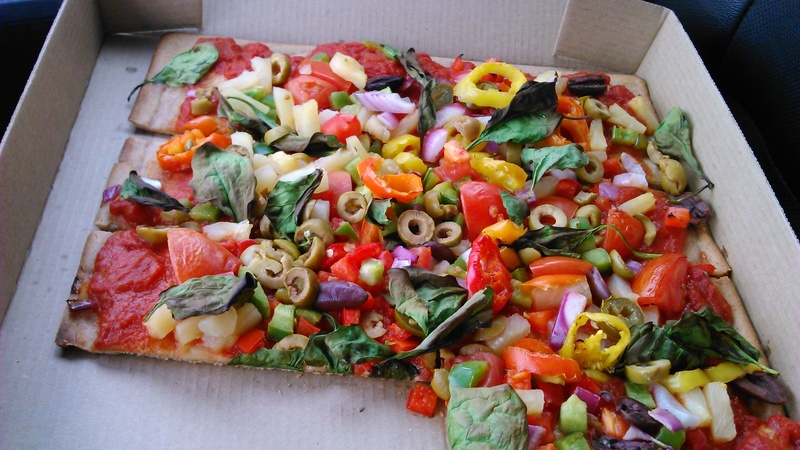 Gluten-free crust, with green olives, kalamata olives, spinach, green pepper, pineapple, hot banana peppers, tomatoes and red onion. Interestingly, though I’ve only been doing this for a few weeks, and I am probably the unhealthiest (aspiring) vegan ever, I put on some pants today that I couldn’t even do up last time I tried them on, and while they where still a bit snug, I was able to do them up reasonably easily. Could it be that veganism, even when you eat as much as you want of everything (like I do – for example, eating whole pizzas), actually helps you lose weight? I suppose only time will tell. I’ll keep an eye on it though. There’s definitely still a few pounds lingering from each of my pregnancies, and while it’s never really bothered me, I wouldn’t complain if I got to fit in all my old clothes again (that I’m still hanging on to for some reason). 2 slices of toast with vegan margarine. We (he) cooked rice, but mixed in with the water the rice was cooked in was 1 teaspoon paprika, 1 teaspoon cumin, 1 teaspoon tomato paste, 1 teaspoon cayenne pepper, and a little bit of salt and oil. 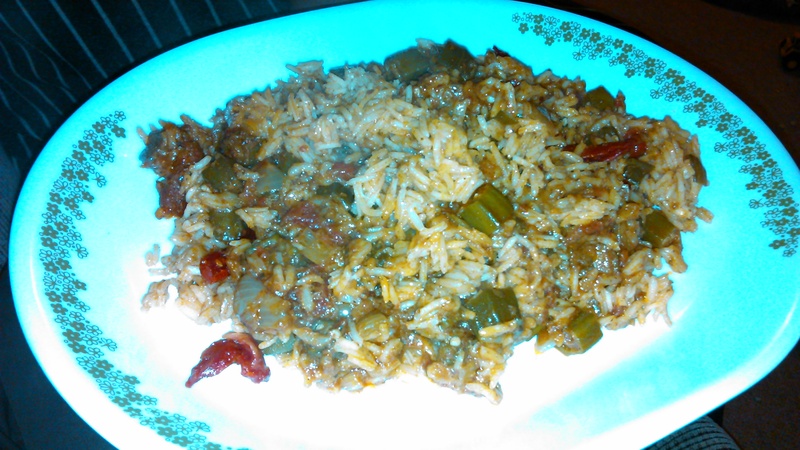 After the rice was cooked, we mixed in some okra, and baked the mixture in the over for about 15 minutes at 300°F. Then we added a layer of leftover rice from the night before and baked again for about 20 minutes. Half a chocoate-almond covered coconut milk bar. Thank you for your query! It is Vegan Friendly! We are pleased to offer a Gluten Smart pizza. We have the crust itself made for us in a gluten-free facility. It is produced only for Panago using a proprietary Panago recipe. At the store,we use special pans, utensils and procedures for our Gluten-Smart pizzas. When informed of any food allergy, we have one person who follows our allergen guidelines, make the pizza from start to finish, to reduce the potential for contact with the allergen. We have also confirmed the Gluten-Smart Crust to be Vegan friendly and free of all major allergens (dairy, soy, wheat/gluten, sulphites, shellfish, peanut and tree nut, mustard and sesame seed). We are delighted to let you know that the Gluten Smart Crust is made with wholegrain sorghum and sweet rice flour, instead of traditional wheat flour, and contains flax seed. We do let everyone know that our products are prepared in an open-kitchen environment, we cannot guarantee a 100% allergen-free environment. We do make flour based crusts at the store. We do want celiacs and people with severe gluten allergies to be aware. We do want to ensure we take every precaution on our end and advise them that the efforts we take may not be enough if they have a very extreme sensitivity. Our Gluten-Smart pizza is thinner and crispier than our regular hand-tossed crust and it has a slightly sweeter flavour and a great crunch. We have very few gluten items. Two sauces, the Coconut Curry, and Butter Chicken. Three toppings, the Genoa Salami, Meatballs, and Meat-Free Pepperoni. If you get a salad remember to remove the croutons. Both types of our breadsticks and all four flavours of our wings do contain gluten. Recipe pizzas like the New York Deli, Italian Deli, Genoa Classic, Butter Chicken, Veggie Korma, Meat-free pepperoni, Meatball, and Super Cheezy Meatball contain either a topping or a sauce that has gluten. We do want to let you know we have made an effort. We do want to offer our customers with a gluten intolerance or allergy an option. We hope we have provided you with enough information to decide if this is an option for you. All of our cheeses are made with a microbial enzyme, instead of rennet, which is a plant derivative. Know there are many types of Vegetarian. 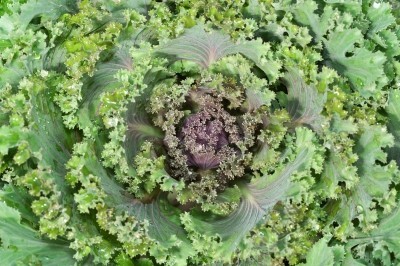 A traditional Vegetarian, who would eat dairy, or a Vegan, who would not eat any animal products. For a tradition Vegetarian, all our cheeses can be recommended. I have included a list below suitable for a Vegan who would not eat dairy or eggs or any other animal products below. 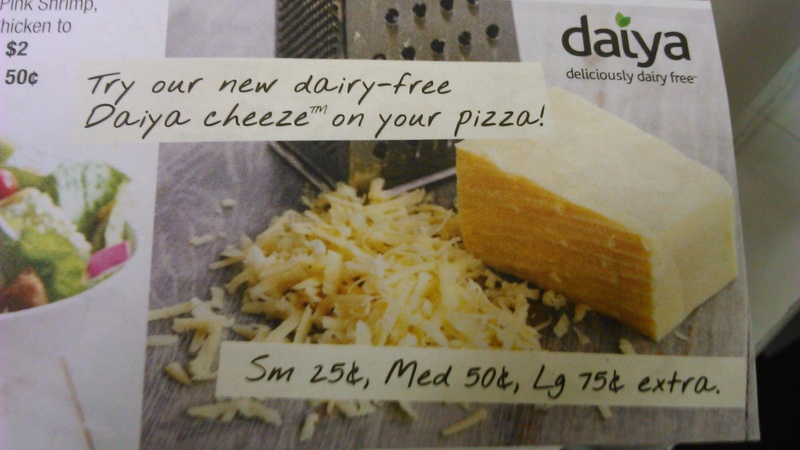 We do not currently have a vegan-friendly cheese option. We have found a cheese-less pizza is often ordered. One of my favorite breakfasts, because it is easy and delicious is Quaker instant oatmeal. Today I had the maple & brown sugar flavor. Yummy! Just add hot water, and there you go! I do actually like to eat my oatmeal with a little bit of milk, and from past experience I know that my favorite milk substitute is Almond Fresh. For use in things like oatmeal (or cooking/baking) I just use the original version. Of course, if you sat down to a glass of the original Almond Fresh expecting it to taste like a glass of milk, you’d be disappointed. That’s why, for actual drinking out of a glass purposes, with a cookie, for instance, I absolutely LOVE the coconut version! It is possibly even better tasting than actual milk. But I do love the taste of coconut, so maybe that’s just me. Or maybe it’s the cookies I keep eating with my milk. Lunch?! Ain’t nobody got time for that. Just kidding. Sort of. I do typically eat lunch, however I don’t have the best track record of eating lunch on Sundays. Because of my Sunday schedule, I often find myself going without a mid-day meal. I did have a tiny snack during the day. I offered my daughter some yogurt melts that someone had given us as a gift. She ate a whole bunch of them, and seemed to really like them. So I offered her another big handful, which she started throwing at the other people in church. They were all slobbery, so I didn’t want to put them back in the package, but I also didn’t have anywhere else to put them, so I ate them. They are, obviously, not vegan. And for an adult, also somewhat of a waste of a cheat. So anyways, no real lunch, but don’t worry, I make up for it by eating dinner twice. As you can probably tell, there’s no cheese on this pizza. I got it from Panago, and as they don’t offer a cheese substitute, I considered adding some of the daiya pepperjack style shreds that I enjoyed so much last night. 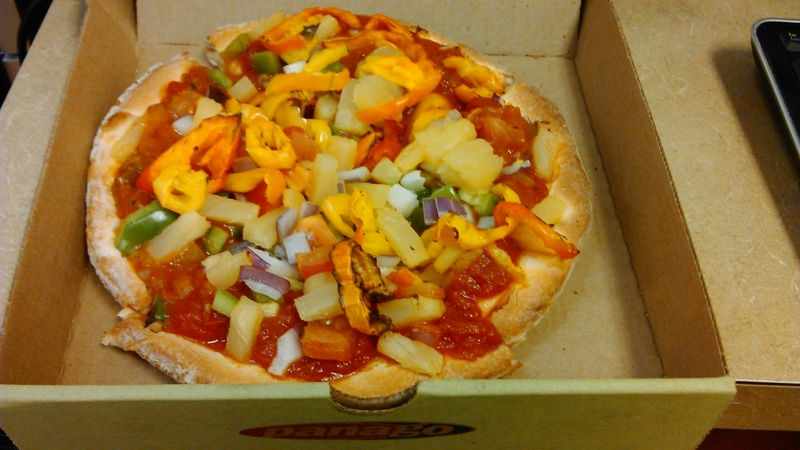 However, in the end I decided to just try it out sans “cheese.” The pizza in the picture above is the regular hand-tossed crust, with Italian tomato sauce, and it’s loaded with green pepper, red onion, tomato, pineapple and banana peppers. I wasn’t really expecting that much considering that there’s no cheese on it, but it was great – a very fresh tasting sweet and spicy meal that I would definitely eat again. Who knew? Fruits and vegetables actually taste good! In addition to the fruit on my pizza, I also enjoyed a lemonade juice box from Panago’s organic juice line-up. As a lemonade lover and a juice box lover, I was grateful that dairy has not infiltrated the world of juice (as far as I know…but I wouldn’t put it past dairy to try), so this was obviously a safe vegan choice with no disappointments. Now since I plan on ordering Panago again (I eat a lot of pizza), I needed to do a little research on which of their other menu items are vegan-safe. 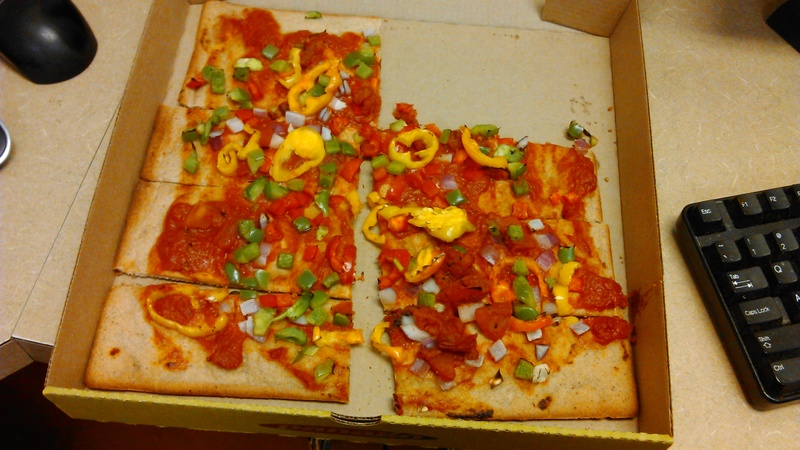 What I found is that all of the pizza crusts are animal product free and they do have a veggie pepperoni topping, but aside from the obvious options such as the real meat, cheese and sour cream, there are also a few other things to avoid ordering on your vegan Panago pizza. These are the pesto sauce, the cheezy cheddar sauce, the jalapeño white sauce, the chipotle cilantro sauce, the coconut curry, the butter chicken sauce, the sautéed mushrooms and the caramelized onions. None of Panago’s breadsticks are vegan friendly either. As far as the dipping sauces go, most contain dairy, but the safe dips are the Italian tomato, cayenne hot sauce and the BBQ sauce. While we did decide to forego those ingredients for convenience tonight, sounds like it might not be a good idea to do so regularly. If Wikipedia is to be believed, tahini and nutritional yeast pack a nutritional punch, so we’ll definitely want to pick some up for the future. When we do, I’ll hopefully have some helpful tips for tracking it down in the grocery store. The only changes my husband made to the recipe (aside from the omission of the tahini and nutritional yeast) was that we used lime juice instead of lemon juice, and instead of the (optional) 2-4 cloves of garlic we used an entire bulb. Yep. We love garlic. Also, my husband did buy earth balance margarine as the recipe called for, but I expect that vegan Becel would have worked just as well. As I’m sure we’ll be making this recipe again, we’ll certainly have the opportunity to find out for sure. Taste-wise, the pasta sauce (which we ate on fettuccine) was delicious! To be clear, it’s not that the pasta sauce tasted *exactly* like any other alfredo sauce I’d ever had before (although, who knows, when we try it with the nutritional yeast and tahini, maybe it will), but it just doesn’t really need to be compared. It’s a wonderful sauce. Pasta, to my surprise, is actually typically vegan, so no big changes required there. This is a recipe I think we’ll keep in mind to help us deal with the potential issue that when I invite someone over for dinner, I almost feel guilty serving them vegan food. I would feel absolutely zero guilt serving this.